Autumn is now official by the calendar. Yet I've known it has been on the way for the last several weeks simply because of a suddenly arachnophobic daughter who screams at the sight of every spider. Living in a rural environment, one might mistake our home and yard and car for a horror-flick stage lot. 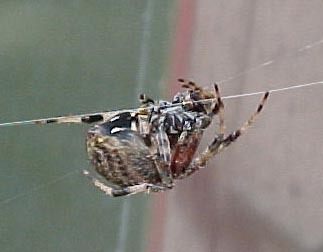 It's that time of year when our web-weaving eight-legged friends are at their busiest. Their pickin's must have been extra good this year for they all seem larger than normal. Everywhere you look there are webs with big, fat spiders planted square in the middle of them—just waiting. Their active season is winding down as they prepare to mate and die, or mate and hibernate, whichever the case may be for their particular species. Still, in all, the many make glorious the early morning as the mists define the miracles of their endeavors. There were more screams which I'm never up to in the early mornings, but I managed to save the life of the fat one by gently removing the web with the spider and setting him/her to the ground to find some better locale to set up shop. What I didn't know was there was another tag-a-long that day. The workday ended and I got into my car noticing nothing amiss as I pulled out into the evening rush hour traffic. Suddenly, the very-much larger mate of the morning spider dropped and dangled two inches in front of my nose. Now I know why some fatal accidents are never explained. There was no alcohol or drugs in the driver's system, they didn't have a massive coronary, and they didn't have a sudden stroke. It wasn't from an incipient attack of dementia or psychosis. Some investigators walk away from the crash and the follow up autopsy never knowing. They end up shaking their heads in wonder. Well, if I didn't have an answer for them before I do now. It was simply by the grace of God or some higher power that I didn't crash my car and kill myself. 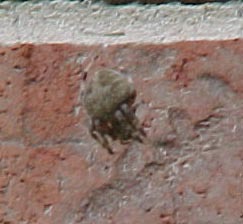 And while I hold no real horror of spiders save the Black Widows, Tarantulas, and the "Almighty" but harmless Wolf spiders, that spider looked about 3 feet in diameter as it closed in on my nose. The surprise was enough to shock me and it did take a second or so to realize what had happened. Okay, so my head and neck along with the rest of my body attempted the reversal that only 30 G's can bring about—I maintained control of the car. Trust me, if a snake had done the same, I'd have been dead along with about half of the travelers on Route 50 within a mile radius of me. I really don't like snakes. 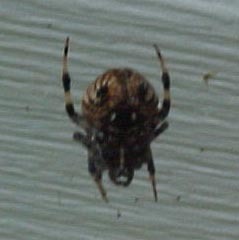 Now spiders, even big, fat, ferocious looking spiders, I can deal with—just not plopped on my nose thank you very much. So, trying to keep my focus on the road and on the dangling spider just a hairbreadth from my nose, I slowed to a stop at a red light. With infinite care, I leaned to the glove box in hopes there would be a cast-off tissue or napkin. Lucky for me there was. As gently as possible, I corralled the little bugger and hoped I didn't squeeze him into 'spider-jelly' before casting him out the window and into freedom where he/she could spin more webs and live another day. At the last second, I twitched and 'spider-jelly' it became. It must have been a reflex and not anger—well, I don't think it was anyway. The crisis past, I tried to catch my breath along with some semblance of normality not to mention dignity. I had almost managed it until I glanced to my right where a fellow traveler had witnessed the 'spider incident' in its entirety. The gent, a man about age 50 or so, gave me a nod and a salute. I think he was just grateful that the "woman-in-the-car" beside him hadn't gone totally nutso and created havoc upon the highway. Somehow, I got the feeling that he didn't expect it of me. The light changed and my adrenaline rush subsided. I was homeward-bound and ensured, at least that evening, that my windows were rolled up tightly. As this morning was a Sunday, so it was much later that I attempted to snap their pictures, yet many had hidden. Those of the largest sect appear in the earliest of hours or the latest of them. 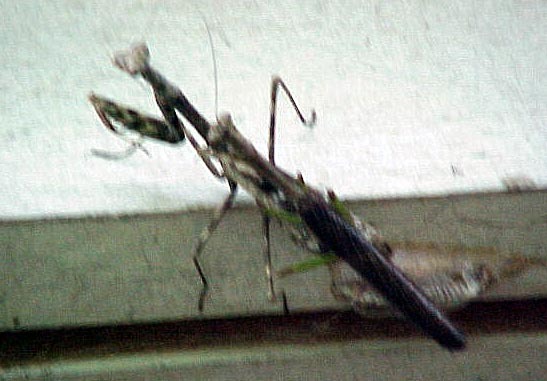 The only unrest I found today was a pair of mating Praying Mantis, the female had just finished munching down the large spider from the web below it. Life is hard. Yea, life is cruel. Still, I could nearly hear the sigh of my daughter as one less spider lived. I walked away and shook my own head in the wonder of it all. Few of us know not what we ask. Life can be almost silently brutal when it wishes. Do spiders scream?